The origins of the winery belong to the Colla Family, which has been growing vineyards in Piedmont since the middle of the 19th century. The territory of origin is Santo Stefano Belbo, a land of great Moscato, Langa that borders with the Monferrato. Generation after generation the family moves down to arrive in Alba, especially in Diano d’Alba, hill of excellence for Dolcetto, where in 1913 Paolo Colla was born. Paolo Colla vinifies Dolcetto with great passion but dreams of Barolo. 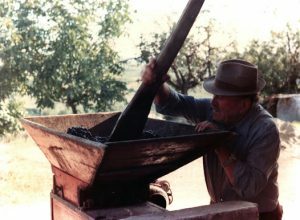 It is 1961 that manages to acquire a farm in La Morra where he can finally grow and vinify Barolo. From the beginning they are wines of great finesse and longevity, that gets important recognition in the main wine expositions of the time. In 1972 Marivanna Colla, Paolo’s only daughter, married a young man from Roero: Gianni Gagliardo. Gianni is a young boy with so much ambition and is Paolo, with paternal affection, to transmit his passion for wine. The bottling of home-made amateur wines becomes professional. In addition to the traditional Barolo of Paolo Colla, the first wine created by Gianni could only be in the Roero area, his homeland. The early ’70s are a great time for this territory thanks to the intuition of some great producers of the time who start producing white wine on its sandy soils. The vine chosen by these is Arneis. Therefore the Favorita remained, a vine at the time almost disappeared that Gianni has therefore decided to adopt. Start of production of Moscato, which subsequently became an independent winery with the name of VillaM. The Colla family had never stopped growing Moscato, even planting it among the rows of Barolo, and this moment somehow marks a return to the origins. After Paolo passed away, Gianni Gagliardo assumes the reins of the cellar that bears his name, inheriting the tradition of the Colla family. In 1986 the Paolo Colla Winery became Gianni Gagliardo, and a very special new logo was chosen: a falling mask that symbolizes the depth of wine and its ability to create strong bonds between people. ” In Vino Veritas ”.. Towards the end of the decade new techniques were introduced in the cellar. It was in fact very recently that in Piedmont the tests of use of the French barrique began. Gianni decides to take an alternative route, and starts working with the most sober 500 and 700 liters tonneaux. Meanwhile the vineyard surfaces grow. After his studies in Enology, the firstborn Stefano joins the company. The new generation lives the wine with great passion, and immediately participates actively its thinking. It is in fact at the end of the decade that the family gradually begins to invest in new land from Barolo. It is the year in which the winemaking trials of the Cru begin. It is about micro-vinifying the vines in small sub-parcels, in order to understand where is the best quality of each hill, the peculiarities of the various areas of the vineyard, and the best way to make wine out of them. Exactly ten years after the start of the small tests, the first two winery Cru had been released, now called MeGA (Additional Geographic Mentions). They are Barolo Lazzarito Vigna Preve 2013 and Barolo Castelletto 2013. The return to the big casks. And as far as the Cru are concerned, customized containers are sized to optimize the vinification and ageing. In July 2017 the family acquires Tenuta Garetto, a beautiful estate with 10 hectares of vineyard and winery in Agliano Terme. In the heart of the most premium Barbera area in the world, recently defined by the new appellation Nizza docg.